The two-seat eVTOL SureFly recently made its first untethered flight. 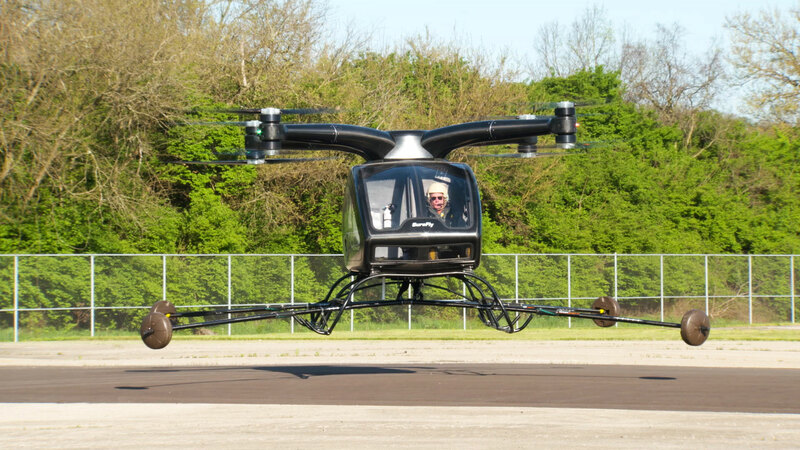 Workhorse made the first untethered flight of its SureFly two-seat hybrid electric vertical takeoff and landing (eVTOL) urban passenger vehicle last week. The flight lasted approximately 10 seconds and the aircraft reached an altitude of four feet. This follows “hundreds” of tethered flights during testing for noise, as well as the battery and flight control systems, a company spokesman told AIN. The company plans to offer both piston- and turbine-engine versions of the aircraft, but declined to name engine manufacturers. “The program status is to continue to increase the [flight] envelope in height and duration, and at the same time we are in full-fledged work with FAA type certification,” the spokesman said. The SureFly has a two-person, 400-pound payload capacity and a range of approximately 70 miles. Target price is $200,000. The hybrid aircraft is powered by a fossil-fueled generator linked to a parallel bank of battery packs. Its electrical system powers motors linked to four propeller arms, each with two contra-rotating propellers. The batteries can power the motors if the generator fails. In addition, the airframe has a ballistic parachute. Last year Workhorse announced its intention to spin off SureFly into a separate company. Under terms of the deal, Workhorse plans to issue $5.75 million worth of notes that it anticipates can be exchanged into preferred stock and common stock warrants of SureFly Inc. with a valuation of $33 million. I notice you deleted my comment from yesterday. Is AIN Online an aerospace resource or not? If you are yu shuld actually understand and investigate, at least nominally, the topics of your posts. That you have not done so and merely parrot the Workhorse press line is shameful. I checked the website comment log and see no record of any post made under your username yesterday﻿. In addition, nowhere in the press release does it say that the flight lasted just 10 seconds and the aircraft achieved only four feet in altitude, so the author has indeed done some further investigation. It's our job to present readers with as much factual information as possible and leave it up to them to make their own opinions, which I believe we have achieved here.